The funny thing is; a lot of Jeep owners tend to spend a lot of time, energy, and money on things for under the hood or for the exterior of the car. However, when it comes to the inside they forget to gussy it up. Below are a few ideas on how to make the interior of an older Jeep look like new again. One of the easiest things to do inside a Jeep is to replace or install a new Jeep center console. A lot of the older jeeps never had these, so there isn’t any place to lock up your valuables or (if you get the right one) hold your beverages. 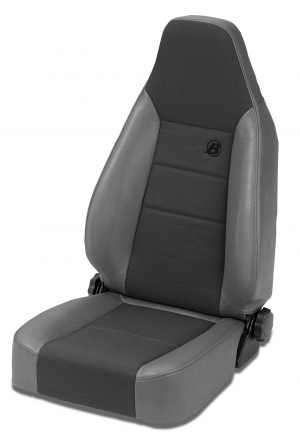 Rugged Ridge makes a great one for 1976-1995 Jeep CJs that comes with a nice one made in black vinyl with a nice padded armrest, two cup holders, and a lock. A lot of the older Jeeps come with seats that are about as comfortable as sitting on a bumpy log all day. Not only are they not comfortable they are not safe, especially for people who spend a good deal of time off-roading. Jeep replacement seats can usually be had for less than a $150 per seat and are very simple to install in the comfort of your own garage. Seat belts are a very important piece of equipment no matter if you spend all your time on the highways or in the wilderness. Old seat belts can easily get stuck or not function properly leading to some very dangerous situation. Jeep replacement seat belts can be easily found in either the standard shoulder belt or in a variety of safety harness. Of course any good Jeep off-road enthusiast knows that if you are going to have any fun out in the wilderness you need to install sturdy Jeep grab handles for your passengers. Now we are not talking about your standard issue grab handles here. We are talking about sturdy pieces of steel wrapped with a little padding. Once you get your new seats installed you will want to dress them up with removable/washable Jeep seat covers with a little storage in the back. We love the Smitty Built G.E.A.R covers made of 600 Denier polyester and seven different pouches to store everything from a first aid kit to extra bottles of water. The true genius about these kits is that they are easy to access while sitting in any seat and they will hold all loose objects in place.